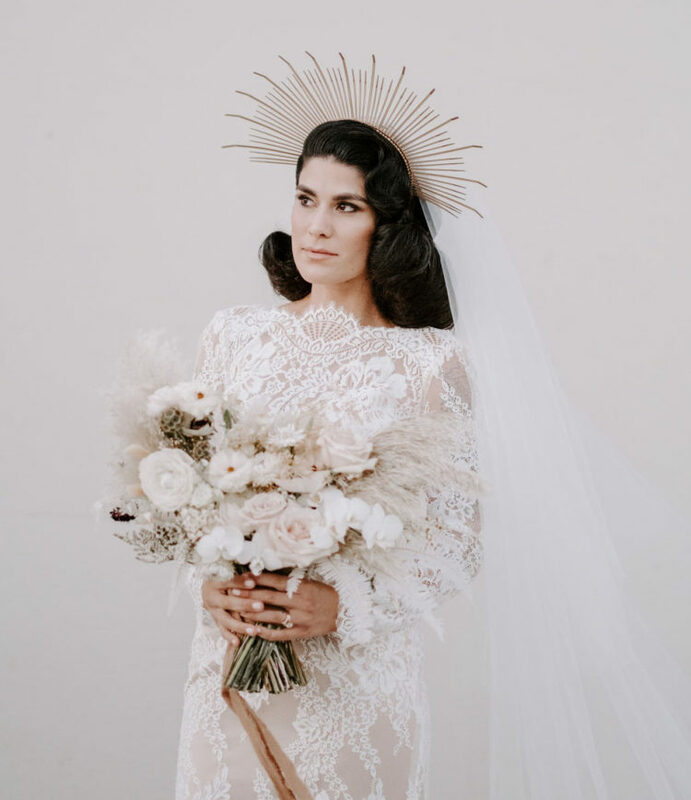 I love white as it’s a timeless color, but moody shades have been on trend lately and finally here’s my eye-candy! 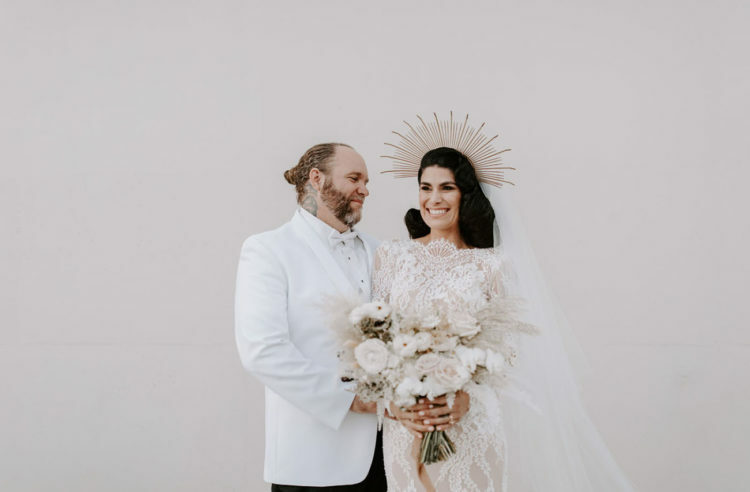 This all-white wedding featured no pops of color and looked heavenly gorgeous! 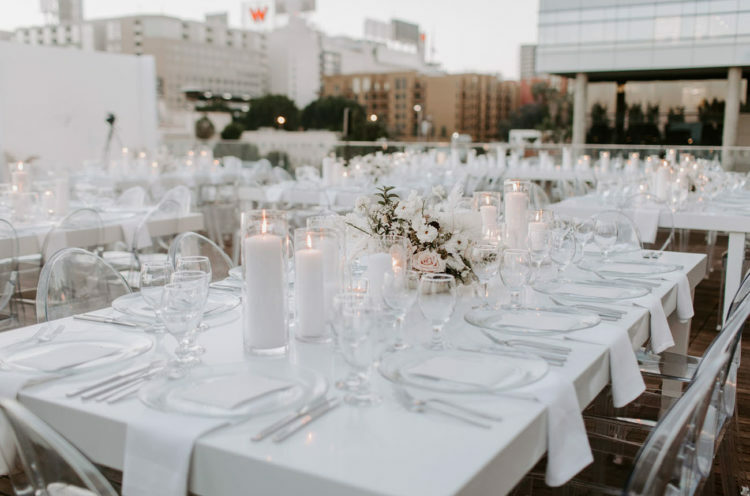 Angela and Greg went for a spectacularly monochrome white rooftop wedding at the Neuehouse in Hollywood. 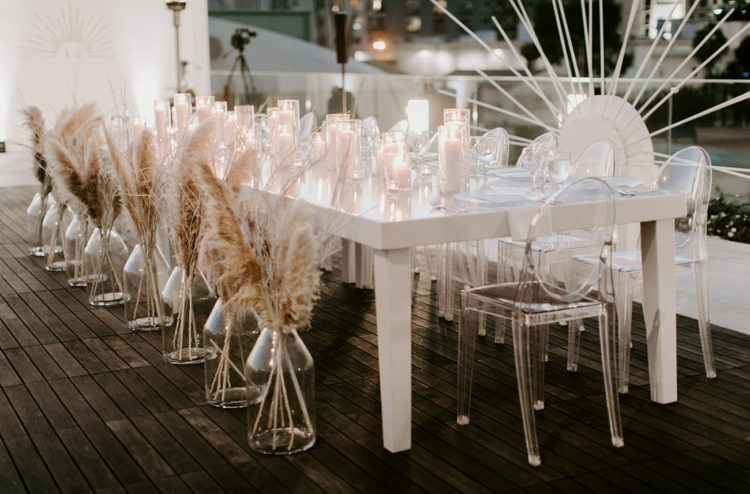 Angela’s vision was to bring in a bit of an Art Deco vibe, while keeping everything modern and chic. 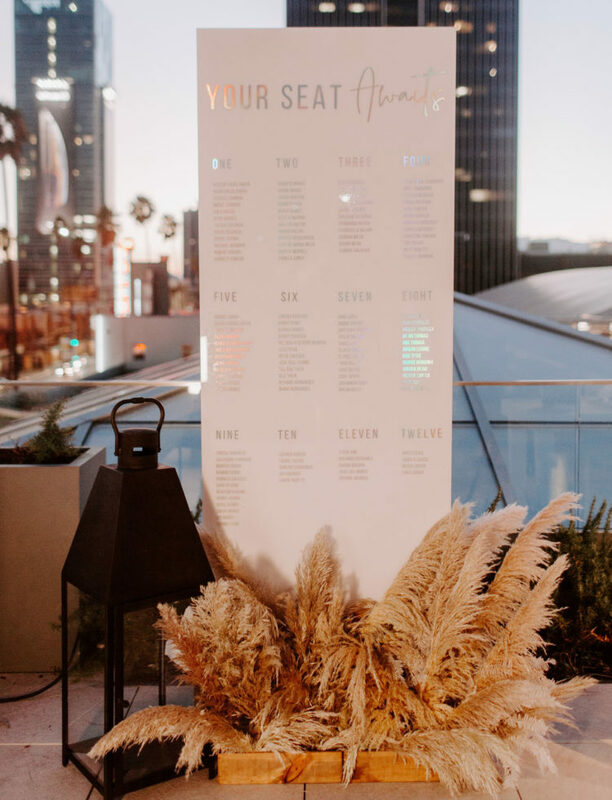 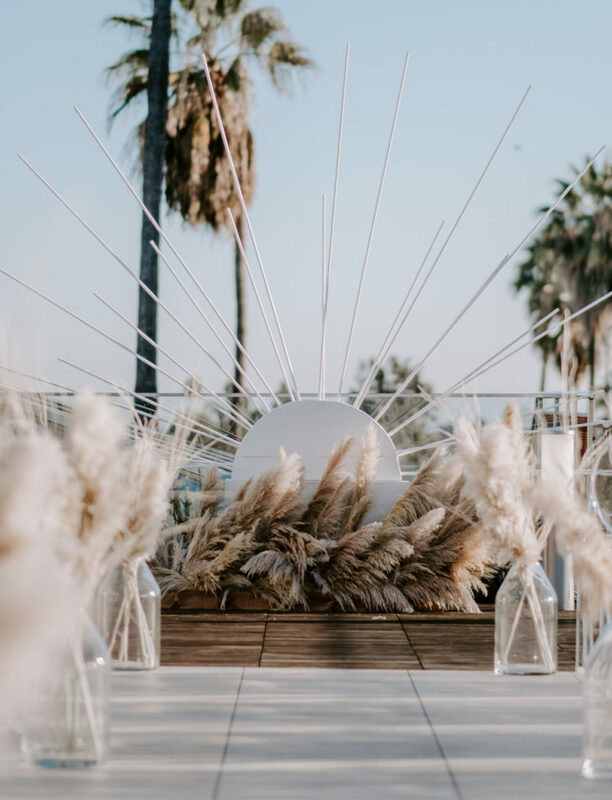 With pampas grass lining the aisles, a copious amount of candles, tables covered in white accents, and light florals throughout, Fawn Events definitely helped them bring their vision to fruition. 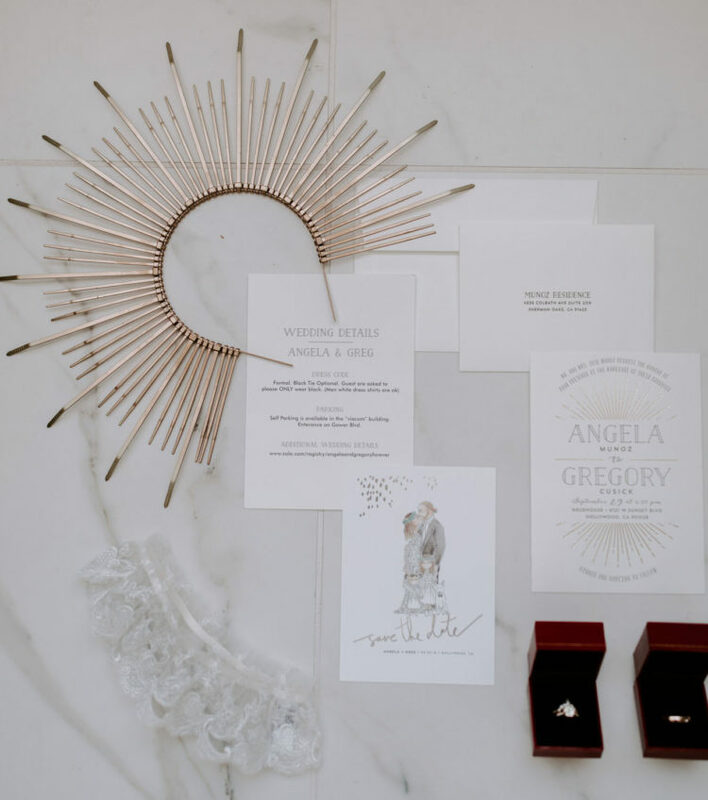 Th first thing the bride wanted to get was her headpiece and everything else based around it: the sunburst backdrop, the details on the invites. 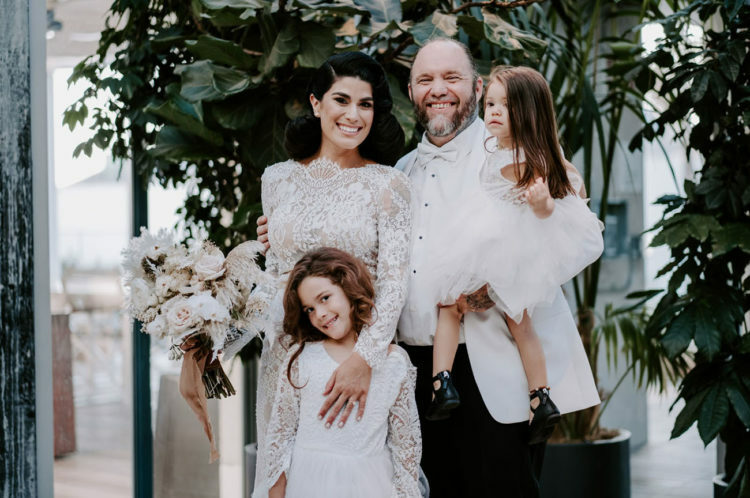 The couple has two daughters and the family helped them with kids to let them feel the day and enjoy it. 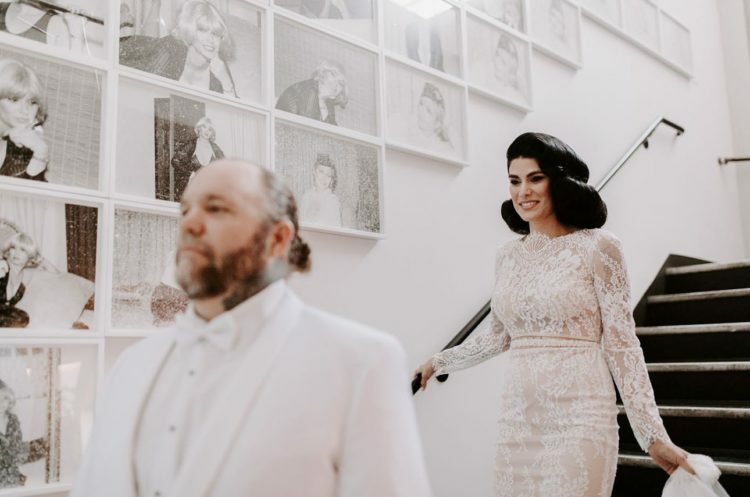 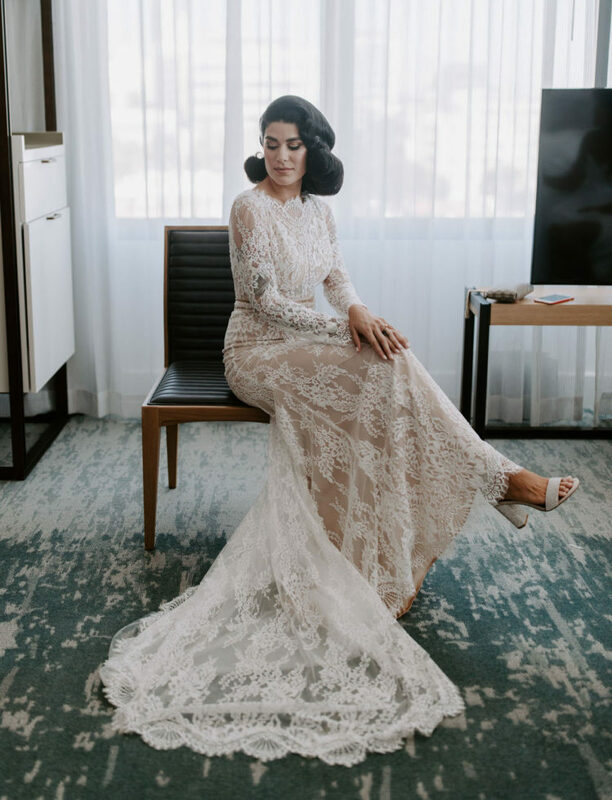 The bride was wearing a beautiful lace wedding gown, with a high neckline, long sleeves and a train plus white block heels. 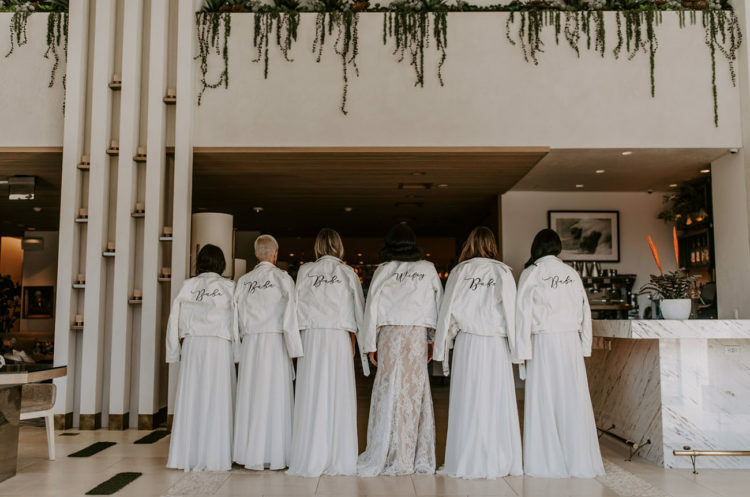 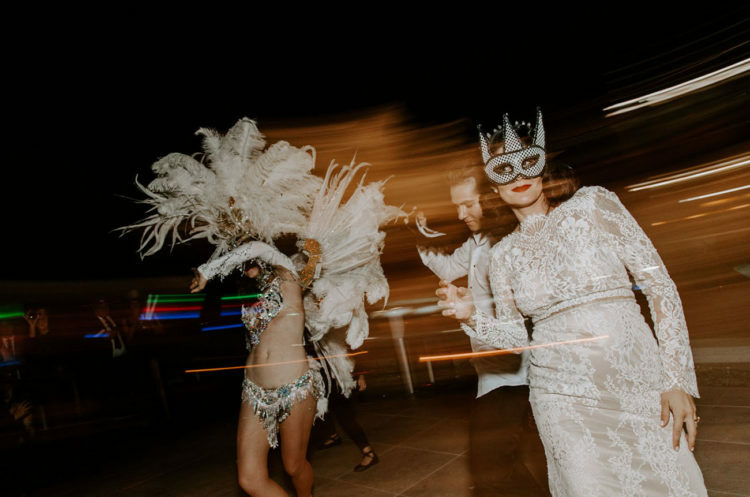 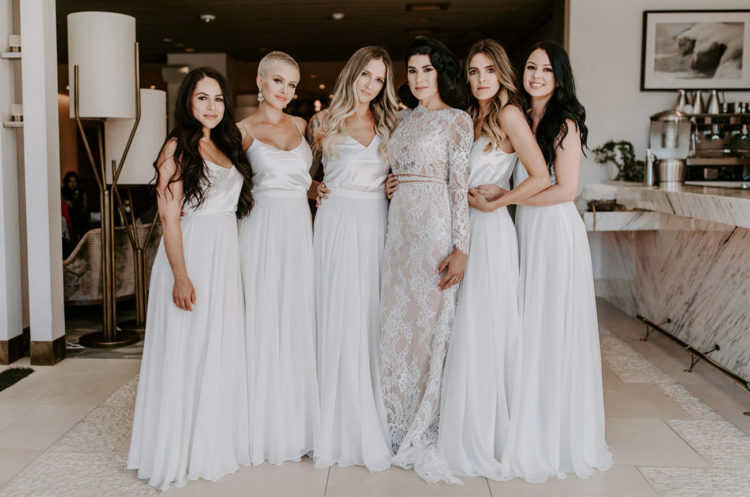 The bridal party was all-white, with white silk spaghetti strap tops and tulle maxi skirts and they covered up with white leather jackets. 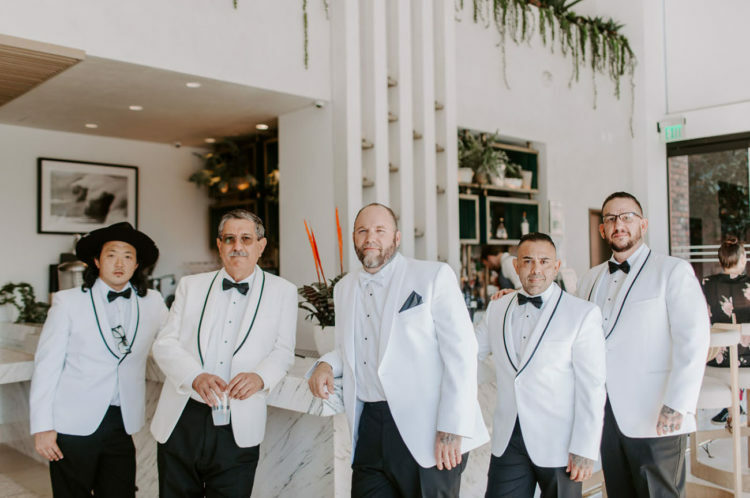 The groom was wearing a white tux and the groomsmen were wearing the same. 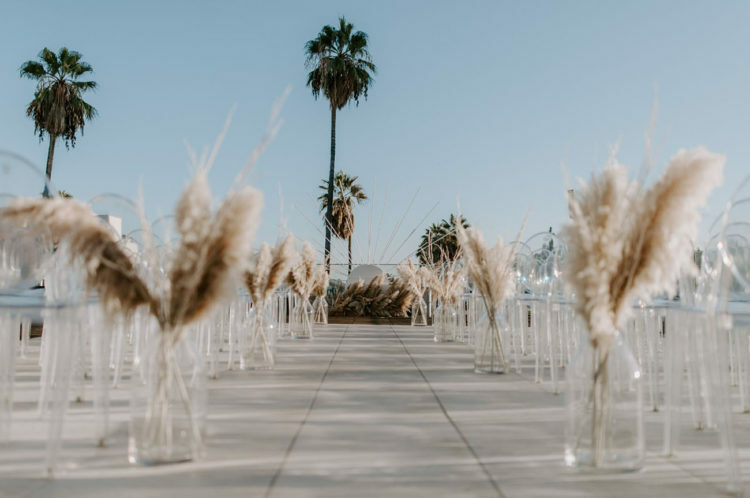 Take a look at the pics and get inspired!